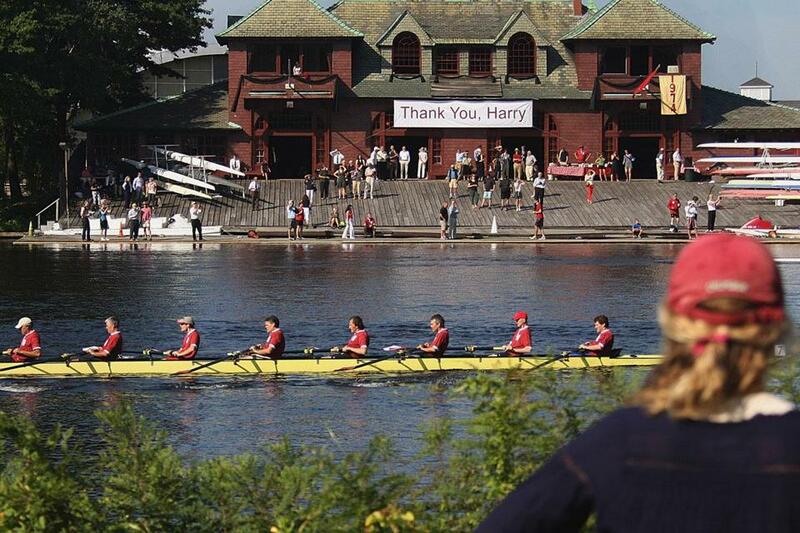 A flotilla with stars from past squads provided an ideal tribute to Harvard coach Harry Parker, who died in June. As flotillas go this one wasn’t nearly as large as the Spanish Armada but over half a century it had acquired more precious booty — Olympic medals, silver loving cups, and enough Yale shirts to enrobe the Anderson Bridge. Five decades of Harvard oarsmen returned to the Charles on Saturday morning for a ceremonial row past Newell Boathouse to pay homage to Harry Parker, their master and commander who died in June after a final triumphant season. They came together, as well, in Sydney and London, where other Crimson rowers took to the water for a salute. There was a five-ringed reunion as well. Vyacheslav Ivanov, the legendary Soviet sculler who won three gold medals in the single and competed against Parker in the 1960 Olympic final, flew in from Moscow and paddled out in a double with Don Spero, his American rival in 1964. “I was invited, and I wanted to honor Harry,” the 75-year-old Ivanov said through a translator. All but a handful of Parker’s 51 captains were present, some of them serving as ushers at the afternoon service at Memorial Church in the Yard, where Henley blazers were the uniform of the day. “The Mister Chips model, where you come back to school 50 years later and he’s still teaching, that’s gone away,” said John MacEachern, the 1981 captain. A five-minute chat was a filibuster from the man they called The Sphinx. “If there was a prize for ratio of influence to words spoken, that’s a horizon job for Harry,” reckoned Blair Brooks, who captained the unbeaten 1975 R&S edition. Parker never gave a pep talk. “There was no strangling of bulldogs,” said Jim Tew, the 1966 captain. It’s their activity, Parker would say. If it’s not important to them, I can’t make it important. His oarsmen were so driven, so competitive that Parker didn’t need to nudge them. As the procession was coming to an end, three of his more recent varsities broke off to race each other to the bridge.